The easy way to start accepting plastic. No contracts, no cancellation fees, and a guaranteed low cost. Rely on customized account setup with in-house support. Save up to $100 on credit card processing services and equipment. Cayan has helped over 5,000 Vistaprint customers save on credit card processing – and we’d love to do the same for you! 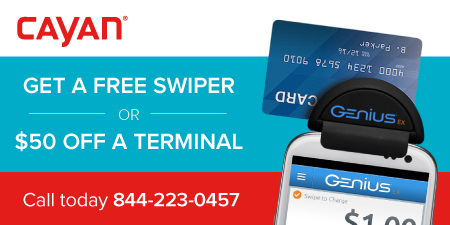 Cayan makes credit card processing as easy as 1, 2, 3! Accept Cayan's special credit card processing offer, exclusively for Vistaprint customers. One of our highly trained account representatives will connect with you to find you the best deal and the best solution for your business. Start accepting credit cards in as little as one business day, and save with our special offers and the guaranteed lowest costs! Why should my business accept credit cards? Why has Vistaprint partnered with Cayan? Is credit card processing right for my business? How does the instant rebate work? My business already accepts credit cards. Can I still take advantage of this offer? Is there any long-term commitment involved? How does a merchant account work? What does a merchant account cost? The simple answer is that your customers want to pay with credit cards and with all the convenient new ways to conduct secure transactions, why wouldn’t you let them? Credit card payments never bounce, allow businesses to receive immediate payment from customers around the country, and can increase sales dramatically. Cayan has been a leader in the credit card processing business for over 10 years. We are known throughout the industry for our strong ethics, commitment to customer service, and guaranteed lowest processing costs. With the advances in technology, businesses of all types can now affordably process credit cards and increase their sales. Merchants can now conduct real-time mobile transactions on their Android, iPhone or Blackberry device, on secure internet portals and with literally dozens of different types of hardware perfect for their own unique circumstances. Cayan is offering an instant rebate of up to $100 on credit card processing products, services or hardware. The rebate varies by the product or service selected and will be rewarded upon account approval/activation. Of course! Our special offers include a $50 instant rebate for credit card processing services and we guarantee to save you money over your current processing. No. Unlike most processing companies, Cayan has no contracts or cancellation fees, and you can leave at any time. Merchant accounts are fairly simple. When you process a credit card sale, the merchant account provider clears the payment against the customer’s card provider and provides the merchant with an approval. Once this happens, the charge is credited to the merchant and the funds are promptly deposited into their business checking account, usually within 24 hours. The exact costs depend on the type of business and cards being used, among other factors. Typically there is a small percentage (or discount rate) and flat fee assed to each transaction. Typically these fees combine to be around 2% of the total sale. There are also small fixed monthly costs which vary depending on the merchant’s circumstances and processing environment. Cayan can put together a customized schedule of rates and fees with no commitment on your part.